Corner Pin Create a corner pin based on a mask track. Just place the corners on the current frame where they should be and MaskTracker+ adds keyframes to move it with the mask. In addition to the normal corner pin also CC Power Pin and Red Giant Warp corner pin are supported. Stabilized Precomps The popular stabilized precomps of MochaImport+ are also available in MaskTracker+. 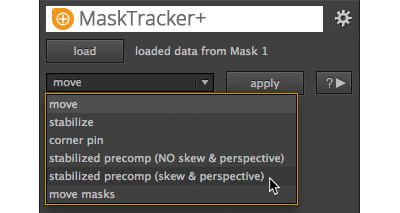 Track an object with the mask tracker and MaskTracker+ creates a precomp for you that shows a stabilized view on the tracked object. In this stabilized setting you can do any kinds of modifications and everything you do is also automatically applied to the original perspective. This is a life saver for retouch, painting and removal jobs. Stabilize Footage Stabilize shaky footage based on a mask track. MaskTracker+ can either eliminate the movement completely or create an advanced stabilization rig where you can fine tune the amount of smoothness for position scale and rotation independently. Move Masks If you have several masks moving in the same way, you can save time by just tracking one mask and applying the tracking data from it to the other masks. Track your mask with the mask tracker as usual. 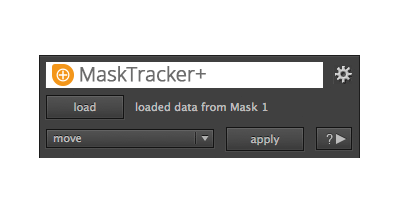 Select the mask and click the load button of MaskTracker+ to load the tracking data from it. Choose the function you want to use (move/corner pin/stabilized precomp/...) and click apply. 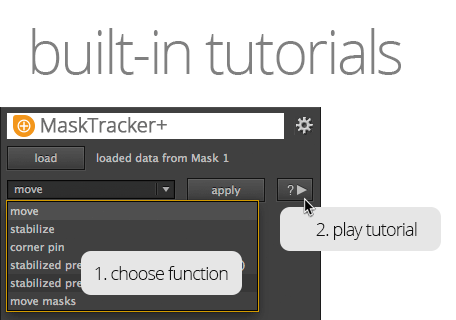 If you don't know how to use a function, MaskTracker+ even has built-in tutorials. The only limitation is that the number of vertices of the mask may not change over time. If you are using the mask tracker, this can be easily achieved if you either don't track perspective or use masks with straight edges for tracking. You can even load the tracking data from several masks simultaneously. This is useful, if you want to average the movement of several tracks to increase the accuracy. It can also be used to change the tracking region over time: Just start tracking one mask and when you want to change the tracking region, stop tracking this mask and continue with a new mask. Should I use MaskTracker+ or MochaImport+? MaskTracker+ has a sister product MochaImport+ which can do similar things, but is based on mocha instead of the MaskTracker.